Extraordinarily, in the almost 9 years that I’ve been playing the violin, I’d say that I’ve had more than 10 rosins. Considering that it take a long time for them to run out, my track record shouldn’t be that high! Over the years they’ve just magically disappeared (I lost them) or I’ve accidentally smashed them and therefore had to buy another. For those of you that don’t know, Rosin is the sticky stuff bowed string players rub on their bows to cause the string to vibrate through friction. Without rosin, there is no sound and no sound means no music – so finding a good rosin that works for you is crucial. My rosin experience began with a standard “student” rosin that came with my first violin. These rosins do the job however they’re usually very sticky and generate a ridiculous amount of dust. These types of rosin often create a gritty, scratchy tone which is not helpful, especially for the beginner student. Please stay away from rosin that comes complimentary – they’re usually of poor quality. I’ve been duped into buying some really crappy rosin and it just isn’t worth the money or the heartbreak of it being rubbish.I’ve bought the rosin so you don’t have to. Rosin in general is very affordable so it is easy to buy a better quality one instead. Throughout the years, I have bought an array of different rosins and just experimented with them. I’ve used the whole spectrum: light, dark, hard and soft. I’ve read that lighter rosins are recommended for upper stringed instruments because they tend to be harder and more dense. Personally, the rosins that I have liked and gravitated towards have been dark so now I usually only buy dark. Saying that, I recently have been using the Gustave Bernardel rosin which is lighter in colour and I’ve been loving it. This rosin has good grip and focus on the string and most importantly it helps me create a really clear and smooth tone. Hidersine 3V Rosin – around £3-5 – Amber. I’d say this a good rosin for the beginner. Also, this rosin is packaged in a tin which I found almost impossible to open. AB Rosin – £2.50 – £5 – Dark. This is a brilliant, reliable rosin. It has good grip, doesn’t create very much dust (the dust is very fine and light) and helps create good tone production. This rosin is for anyone from beginner to the most advanced player. If I can’t get hold of my usual Pirastro rosin, I’d opt for this one. Kolstein Ultra Formulation Supreme Rosin – around £12. I haven’t used this much but it does have good grip. I’m not sure it is worth £12 but to be honest I bought it because of the gold packaging! Pirastro Oliv – £8-12- Dark. This rosin is another excellent rosin, similar to the AB. It has good grip and has a fine dust deposit. I think I lost this one pretty early on so I want to buy it again. Pirastro Schwarz – Black. This is my holy grail rosin. I love it! It has everything that I look for in rosin*. The best thing is it is only £4! Click here. smooth grip. To be honest, I was attracted to the gold aspect rather than the capabilities of the rosin itself. Again, I think I lost this one on orchestra tour in Belgium so I did’t get to use it for very long. *In rosin, I personally look for one that helps with smooth tone production, good grip but not too much and low dust creation. You’ve probably noticed in the my list above that Pirastro is a recurring theme. 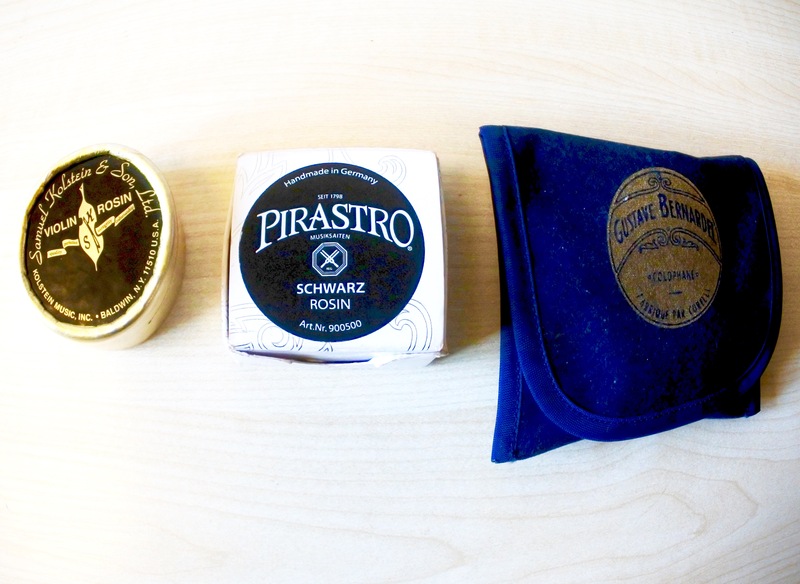 Pirastro is a brand that offers a large variety of rosin of excellent quality and good price point. It is my go-to brand for rosin. There are so many rosins to choose from so if you’re unsure about which one to go with, I highly recommend Pirastro. I’m still experimenting with rosin and I’m planning on road testing 3 more: Pirastro Evah Pirazzi Gold rosin; Pirastro Oli/Evah Pirazzi and Jade L’Opéra rosin. My violin teacher suggested the idea of mixing rosins (i.e. applying a few rather than just the one). I know that some luthiers use powdered rosin which is often a mixture of many different rosins. This is something that I’m currently exploring. Finding a good rosin is a very personal aspect of string playing. For some, it’s very simple whereas for me it has been a real quest and I’m sure it’ll continue into my professional career.